Confused by some of the Britishisms? Hover your fine, mousy pointing-device over the comic. The wee box of text that appears will define the most difficult diction. 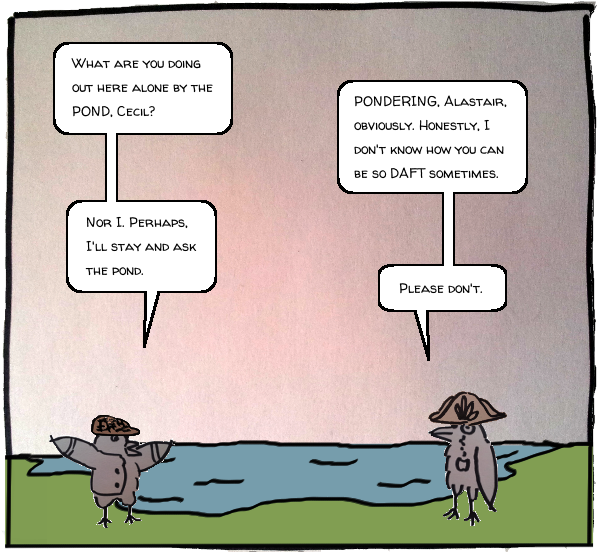 The Right Corking Adventures of Cecil Larkbunting & Alastair Wakerobin updates on Sundays. Call again for more charming British, avian adventures... and always mind the gap. 2013 - 2018 Nathan Ragolia. Powered by Blogger.